The term box-to-box midfielder refers to central midfielders who are hard-working and who have good all-round abilities, which makes them skilled at both defending and attacking. These players can therefore track back to their own box to make tackles and block shots and also run to the opponents' box to try to score. The change of trends and the deviation from the standard 4–4–2 formation to the 4–2–3–1 formation imposed restrictions on the typical box-to-box midfielders of the 80s, as teams' two midfield roles were now often divided into "holders" or "creators". Notable examples of box-to-box midfielders are Bastian Schweinsteiger, Yaya Touré, Luka Modric and Radja Nainggolan. Defensive midfielders are midfield players who focus on protecting their team's goal. 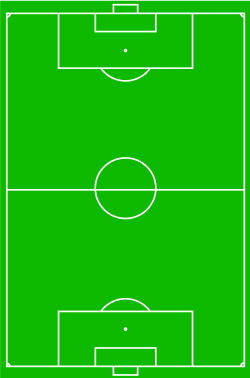 These players may defend a zone in front of their team's defence, or man mark specific opposition attackers. Defensive midfielders may also move to the full-back or centre-back positions if those players move forward to join in an attack.Sergio Busquets described his attitude: "The coach knows that I am an obedient player who likes to help out and if I have to run to the wing to cover someone's position, great." A good defensive midfielder needs good positional awareness, anticipation of opponent's play, marking, tackling, interceptions, passing and great stamina and strength (for their tackling).